Short run kit with resin and vacuformed parts. The Supermarine Walrus is a perfect example of "handsome is as handsome does." Many might dismiss it as an ungainly-looking little biplane flying boat, but the thousands of British and Allied aircrew who owe their lives to the airplane that recovered them in the English Channel, the Mediterranean, and even Tokyo Bay might be excused if they claimed it was the most beautiful airplane they ever saw. The Walrus was designed by R.J. Mitchell, designer of the Spitfire, whose experience designing small flying boats went back to the Supermarine Baby in 1917; re-engined and named Sea Lion, it won the Schneider Trophy race of 1922. He went on to design a wooden-hulled flying boat, the Seal, which was renamed Seagull I; this was the direct ancestor of the Walrus. In 1925, the Australians ordered six Seagull III aircraft, which were used for photography and geological surveys throughout the continent. Wishing to have a Seagull that could be catapulted from a ship, the Aussies came back in 1932, and Supermarine responded with a metal-hulled catapultable Seagull V, which differed further from its predecessors by having a pusher engine rather than a tractor. The Seagull V featured a one-step hull and retractable landing gear, becoming the first British design to fly with such equipment. The Seagull V, appearance notwithstanding, was outstandingly maneuverable. "Mutt" Summers, Vickers' Chief Test Pilot, performed a full aerobatic routine including a loop at the 1933 Hendon display. It was discovered that the Seagull V had better water performance than any other flying boat, and could be operated in open ocean and rough seas one might not think such a small airplane could handle. In August 1934, Australia ordered 24 Seagull Vs, which finally spurred the British Air Ministry to action, and the suitability of the airplane for Royal Navy use was assessed by LCDR Caspar John, son of the famous artist. In January 1935, the prototype, K4797, went aboard HMS "Nelson" for trials in the West Indies and home waters. After turning turtle once when landed with the gear down, K4797 was finally struck off charge after colliding with an anti-submarine boom in Gibraltar Harbor. It had proven its value by then, and the Admiralty ordered 12 called "Walrus," which differed from the Seagull V in having folding wings for shipboard stowage. The first production Walrus took flight March 18, 1936. When war was declared on September 3, 1939, Walruses were serving aboard 30 battleships and cruisers around the world. The first naval action the airplane was present at was the pursuit of the "Graf Spee;" however, the two aboard H.M.S. "Exeter" were damaged by shellfire and unable to take part in the operation. Following the German invasion of Norway, Walruses aboard the cruisers "Effingham," "Glasgow," "Southampton" and "Suffolk" operated in general reconnaissance and bombing roles, as well as scouting from the carrier H.M.S. "Glorious." When "Suffolk" was detached to shell Stavanger, her two Walruses were forced to fly on to Aberdeen because the ship could not stop to pick them up. After a five-hour flight, they arrived at Aberdeen with so little fuel that one came to a stop in the middle of the runway before it could taxi off. After the fall of France, the Walrus was used for anti-submarine patrols around the British Isles. In the Mediterranean, they flew off ships of the Royal Navy, Royal Australian and Royal New Zealand Navies, and took part in the Battle of Cape Matapan. The Italian submarine "Ondina" was sunk off Haifa by Walrus W2709, which was based at Beirut. The Walrus was responsible for spotting several German supply ships which were at sea to support raiders like the "Bismarck," participating in the interception of the U-boat supply ship "Esso Hamburg," and the sinking of the "Bismark's" tanker "Friedrich Boehme" by the "Sheffield." A Walrus attacked the tanker "Kota Penang" which it caught off Gibraltar in the act or refueling a U-boat, which was later sunk by its cruiser, H.M.S. "Kenya." By 1942, the Walrus had participated in Murmansk convoys, and was withdrawn from further operations following the losses of so many British cruisers during that dark year. In 1943, the Royal Air Force began operating Walruses that had been freed-up from naval operations for air-sea rescue in the Channel as the combined bomber offensive gathered steam. The Walrus would be responsible for rescuing over 1,000 Allied aircrew in the Channel alone, and a total of more than 3,000 worldwide. These operations frequently required the Walrus to land in heavy seas dangerous enough that the airplane itself might become a casualty. Several Walruses were used for this mission in New Guinea, and a Walrus based aboard the carrier H.M.S. "Victorious," piloted by Flying Officer B.L. Ada, RAAF, rescued two FAA Corsair pilots in Tokyo Bay on August 10, 1945. Two Walruses were used by the Argentine Navy aboard the cruiser "La Argentina" until 1958. Other Walruses were obtained by civil operators post-war and operated as whale spotters. One Walrus accompanied the 1947 Australian Antarctic expedition. Like I said at the outset, "handsome is as handsome does." The Walrus made a significant contribution to the Allied war effort in the Second World War. Note: fuselage and resin images not to the same scale as the others. Before the release of this kit by Classic Airframes, the Walrus had been modeled twice before: a 1/72 kit by Airfix in the very early 1960s, and a 1/50 scale version by Artiplast in the mid-1960s, which is still available from SMER. (Editor's Note; it has also been done in 1/72 by Matchbox, and while it builds well, is very basic having limited detail.) Both of these kits require considerable work and some not insignificant scratchbuilding on the part of the modeler to get a worthwhile result. A friend of mine won 1st place in Allied Single Engine several years ago with his Airfix Walrus, but it took him nearly six months to achieve that with what arrived in the box. I built a Walrus from the SMER kit, which required that the entire fuselage be puttied over to get rid of the engraved detail (which included the locations of all the markings). This kit effectively renders the SMER kit as obsolete as it has been for the past several years. The kit is to the new standard we have seen from Classic Airframes with the Reggiane Re.2000 and Re.2001, with the kit produced in metal molds that provide crisply-molded parts with excellent surface detail. The interior detail is all in resin. The only area lacking is the sidewall detail of the forward gunner's cockpit. This problem could be easily solved by closing the cover over the turret, a configuration in which the Walrus often operated. If you feel the need to open the turret, providing the frame detail with Evergreen strip will not be difficult at all. The kit looks to be a bit "fiddly" when it comes to constructing the engine mount and fitting the upper wing, since the engine is canted to the side. It looks to me as if assembling the engine and the center part of the upper wing will allow you to get the configuration correct. The instructions include a drawing for a spar to be made so that the proper dihedral for the upper wing can be set, and I definitely intend to do it this way. 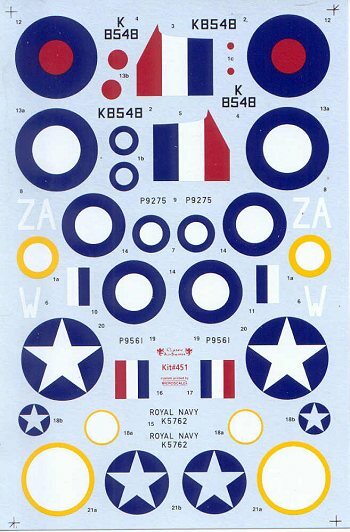 Decals are provided for four Walruses, three operated by the Royal Navy and one by the RAAF. One of the RN possibilities is a Walrus used during Operation "torch", with U.S. insignia, while another is for a Walrus operated during the Norwegian campaign aboard H.M.S. "Shropshire." As I understand it, Classic Airframes has created an aftermarket decal sheet for the Walrus that includes the airplane involved in the rescue in Tokyo Bay described above. The kit looks to be no more difficult than any other biplane kit, and not as difficult as many I can think of. If you have done the Tamiya Swordfish or the Accurate Miniatures F3F, and have a couple limited-run kits under your belt, the Walrus will not tax your skills that much, and the result should be a striking model. This one goes to the top of my "to do" pile. Thanks to Classic Airframes for the review kit.